Daryl Guberman & Guberman-PMC are on a mission to wake companies up to the suspicious and dangerous links and ties Quality associations ANSI-ANAB have been proven to hold. In a new YouTube video, he delivers uncensored documentations, seeing if viewers can “Handle the Truth”. New York, NY (USA), April 16, 2019 — It should be very obvious when an association is responsible for handing out Quality Certifications in very important areas (cyber-security is a good example) that an American company should feel confident that the association looking at their potentially sensitive systems and data can be trusted. For quite sometime now Quality Certification authority and Founder of Guberman PMC, a well-respected ISO quality consultation, compliance and certification company, Daryl Guberman have been investigating and revealing the dangerous truth about some of the largest Quality groups in the world like ANSI-ANAB. What’s been found is that they are led by a Chinese national, who as part of his agreement to be able to work outside his country must report back to the Chinese government about any of his activities or findings, and, to make thing even more complicated and concerning, these associations also have as members anti-American affiliates from places like Iran, Pakistan, North Korea, and Russia to name just a few. Guberman continues his quest to open eyes in this area with his latest YouTube video, “Truth On Self-Oversight By ANSI-ANAB & China-led IAF But Can You Handle The Truth?”. In the video Guberman shows how not only are these associations very suspicious but they actually practice “self-oversight” without any outside, trustworthy, body monitoring their behavior. Surely, something risky and dangerous. Not one to just share unsubstantiated opinions, Daryl Guberman and his team meticulously document all of the elements that they expose about ANSI-ANAB, along with related groups like the IAF, so any companies wondering about the truth can see it all with their own eyes and no filter and come to their own conclusion. A conclusion that would bring any rational pro-American, who is also not an anti-Semite in agreement with Guberman and Guberman-PMC. The truth is, after all, the truth. For more information be sure to visit https://youtu.be/ZaNhbPNmngw & http://dguberman.com. In the eyes of Quality Expert Daryl Guberman & Guberman-PMC there is no reason for a quality certification body that works with U.S. businesses to be led by a foreign national, ties to anti-American organizations an even be headquartered in a foreign country. Unfortunately, that is often the case. New York, NY (USA), April 15, 2019 — Daryl Guberman CEO of Quality certification experts Guberman-PMC is quite ashamed of some of the practices being committed in the quality space on a daily basis, in a trend, that just goes from bad to worse. Fortunately, he has turned to YouTube to expose the truth, through a series of videos signaling in on the practices of the large, influential, and unethical international quality certification organizations like the Chinese-national led ANSI-ANAB. His most hard-hitting video is “ANSI-ANAB & China-led IAF Should Change Their Slogan To: ‘Liar, Liar, Pants On Fire’“. A statement which may sound humorous, but stings hard with the documented truth. Like all his videos, many in the industry are quite happy he is taking the time to do this service. Beyond being China-led, the ANSI-ANAB has within their association hostile to America foreign nations like Iran, Pakistan and Russia to name just a few. None of whom care about doing anything but harming American quality. Guberman-PMC stands against this even hiring veterans whenever possible. With any luck the latest expose will open up even more eyes to the charlatans at ANSI-ANAB and then inspire them to seek quality certifications from “America First” businesses like Guberman-PMC. For more information be sure to visit http://dguberman.com to learn more about quality. New York, NY (USA), April 11, 2019 — Many company’s seriously vital to American interests, like Boeing, sit on the board of the ANSI-ANAB, a quality certification association which is run by the Chinese-national led IAF. If this doesn’t make a company hesitate when considering using them for their quality certification needs, perhaps the knowledge that a long list of countries who openly despise the United States, like Iran, Russia, Pakistan, North Korea and many others are also equal members in these associations. This opens up the privacy and security windows of well-intended American companies who simply want their ISO certifications to cyber theft, and possible corporate espionage, all in the name of hostile foreign entities. One of the lone, and certainly the most dedicated and vocal opponents to this has been Guberman-PMC, a CT-based pro-American Quality company and their founder and CEO Daryl Guberman. Guberman is increasingly well-known for his hard-hitting videos tackling this subject from all directions. In a recent YouTube video, which is short and to the point, Guberman reveals the “Three “Standards” of ANSI-ANAB & China-led IAF: 1) Hypocrisy 2) Cronyism 3) Anti-Americanism” something not many in related industries will want to miss. Guberman-PMC is happy to offer quality consulting and certification for a long list of different ISO’s, covering almost anything an American company could need. All without having to harbor the guilt of working with elements of very serious disrepute or possibly compromising their own security in any way. Expect Daryl Guberman’s video series to continue, and if anything, to become even more intense. Quality and Registration Expert Daryl Guberman of Guberman-PMC has turned to YouTube to make business owners aware that the FTC & State Department has been asked to look into UK-based IT Governance, Inc. for low cybersecurity qualification standards and ties to enemies of America. New York, NY (USA), April 3, 2019 — The need to understand who a business is receiving their ISO quality certifications from is vital in the eyes of Daryl Guberman, Founder and CEO of Guberman-PMC, an expert with over 36-years in the field. The huge problem is two of the largest associations of ISO certifying companies, the IAF and ANAB, are led by a Chinese-national, and contain in their associations openly anti-American and anti-Israel nations like Iran and Pakistan, among many others. In recent news in this area, Guberman has called on the FTC and State Department to look into the activities and standards of UK-based IT Governance, Inc. who specialize in ISO 20071, which covers cybersecurity quality certification. With China being the leader in state-sponsored cyber-hacking worldwide, this shows, in Guberman’s very authoritative, informed and well-documented opinion, signs of being a wildly reckless, inappropriate, and dangerous scam. Guberman breaks all this down and more in his latest YouTube video covering the subject of American and global ISO and quality concerns, “IT Governance, Inc.: FTC, State Dept, Asked To Investigate IT Governance’s ISO Scheme”. Guberman has focused on bringing the message of the threat posed by the IAF and ANAB and companies that join their associations like IT Governance, Inc. for some time now using YouTube as a platform to present clear, black and white evidence against them. 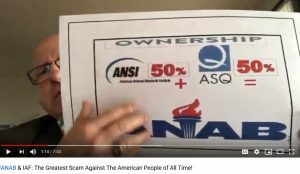 When American business ISO quality certifications are controlled by foreign nationals from countries with long histories of being anti-American or are aligned with nations that are anti-American, anti-Israel, and antisemitic, no one with any experience or wisdom could expect quality to do anything but suffer at best or be totally compromised at worst. Guberman and Guberman-PMC hope that the FTC and State Department use their power to correct this situation before America or its allies suffer from the issue being swept under the rug. For more information be sure to visit http://dguberman.com and watch the new video on YouTube. President Donald Trump’s State of the Union Address has the world talking. 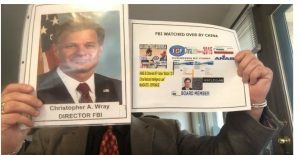 But only one person, Daryl Guberman, is addressing a problem regarding Iran & China and their influence on quality certifications through controlling associations like ANSI-ANAB and the IAF. It’s time to Make Quality Great Again and Guberman-PMC is leading the fight. New York, NY (USA), March 7, 2019 — There’s no doubt that President Donald Trump is doing all he can to make American businesses and the economy proper and for Americans to be able to be proud again. Passionate business leader Daryl Guberman, CEO of Guberman-PMC, is doing his best to help in the world of quality accreditation, which is dominated by the Chinese-national led IAF and their co-conspirators ANSI-ANAB. ANSI-ANAB and the IAF are affiliated with Iran, Pakistan, Russia, and a number of other enemies of America in what Guberman calls the “Quality Cartel”. Guberman addresses President Trump, a man he admires, directly, in his new YouTube video, “Daryl Guberman-CEO Talks With President Donald Trump About Iran & His State Of The Union Address”, about this problem and even presents a solution – the new MAGA Certification. Guberman points to how the new Maga Certification will only be given to United States-based companies who are acting ethically and in America’s best interests. By closing this loop and driving out Chinese-national led associations like the IAF, the entire country will benefit. In addition to the business elements of Guberman’s message he also stressed his appreciation that President Trump took the time to thank and praise Jewish people for their contributions to making America the country it is through hard, loyal, work. Guberman is a Jewish-American himself and it was clear President Trump touched him personally with this powerfully inclusive stance, which is quite rare in a world where Jewish people are often under great threat. Expect Guberman-PMC’s YouTube series to continue as the charismatic speaker Daryl Guberman stands up for what’s right, despite the odds. New York, NY (USA), March 7, 2019 — There’s a big question mark for a thinking American business owner of why they would allow an organization comprised of elements that despise the United States to have any say over the quality of their work or access to their inner secrets. Experienced, educated, honest, and passionate business leader Daryl Guberman firmly believes that this is not ethical or safe and is doing everything possible through his very active YouTube channel to expose the truth to as many business and company leaders, who are proud Americans being duped, as possible. The new video, titled “ANSI-ANAB IAF Member Iran Chants “DEATH” To America!”, is completely backed up by clear facts, something sure to make the antisemitic and anti-American nations who sit on the IAF like Iran, China, Pakistan, Russia, uneasy about being so clearly exposed. In the age of crony capitalism Guberman PMC, an American-owned & operated quality consulting firm, has made it their mission to expose the quality certification alliance ANSI-ANAB-Chinese-National- led IAF as a security threat to American businesses, government, and military agencies. New York, NY (USA), March 7, 2019 — Daryl Guberman, quality expert, patriot, and head of Guberman PMC, LLC has led the crusade to free the area of quality accreditation from organizations that have active member nations who despise the United States, have been caught spying on American businesses, and even have kept on nations which are impacted by the Donald Trump travel plan, quite possibly breaking the law. Guberman, a vocal critic of these kinds of very important issues for quite some time now, lays out the gory details in his new YouTube video “In The Age of Crony Capitalism Exposing ANSI-ANAB-China-led IAF is a Revolutionary Act”. The video has been met with an immediate response that’s been a mix of surprise and anger. Some of the very questionable countries involved in the ANSI-ANAB-IAF mess, despite their being registered in the United States, for appearances purposes, include its Chinese leadership, a nation repeatedly proven to be responsible for Cyber Attacks against the United States on all levels; Iran, who calls for the complete destruction of both the U.S. (who it calls ‘The Great Satan’) and Israel; Pakistan, a well-established stronghold of terrorist training camps and safe houses; to name just a few of the vile highlights. The good news is Guberman’s word is spreading, which means many pro-American companies who had no idea about these connections will likely leave these associations and instead turn to patriotic and transparent groups like Guberman PMC instead. It will be a long and hard fight considering the resources the IAF has, and the reluctance of some businesses to make changes unless forced to, but ultimately it will be well worth it. The situation with quality certification organizations like ANAB and the IAF are getting worse all the time when it comes to things like the security of American businesses and interests. Daryl Guberman of Guberman-PMC has made it his mission to stand against this drive. His latest YouTube video provides a blazing expose. New York, NY, USA, January 21, 2019 — When it comes to the performance of American companies who they receive their quality certifications from or choose to consult about the subject is vitally important. When they are deceived into trusting organizations tied to anti-American nations, it borders on criminal. Guberman-PMC is exposing this issue for all to see, through a series of YouTube exposes put together by the deeply experienced, pro-American, quality expert Daryl Guberman. The most recently released, “#ANAB & IAF: The Greatest Scam Against The American People of All Time!”, maybe the hardest hitting yet. Guberman describes the foundation of Guberman-PMC as being built on his family’s three unbreakable principles of honor, integrity, and the truth – all things directly relevant to a company who is responsible for quality consultations and certifications. Guberman-PMC is able to cover a wide range of different ISO’s with a full list available on their company website. Guberman-PMC feels so strongly about the issue they are very willing to make a presentation, complete with slide show evidence, at any interested company who would like to make sure they are not directly or indirectly supporting places like Iran, Pakistan, Libya, Russia, and most of all China, while opening themselves up to security risks of all kinds from the proven state sponsors of hacking teams and intellectual property thieves. The good news is, according to Guberman, companies can still make a change and break ties with these anti-American and anti-Israel elements and show that they support America, the sacrifices of veterans, and the service being shown by men and women in the Armed Forces. Surely, this will make it much easier for decision makers to look at their own faces in the mirror in the morning with a sense of honor still intact.